Available at the usual place. Sad that we’re going to lose all these things due to digital projection. I will not miss assembling reels, breaking down reels and manhandling 2.5 hours worth of film plus trailers on a single metal platter a yard wide, however. 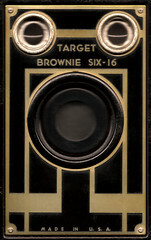 Still a very simple camera, despite shutter speed and aperture controls and twin viewfinders. The body of the camera is thin wood or stiff paperboard painted black on the interior and covered with black leatherette on the exterior. This faceplate is connected to the internal frame & mechanics, and all of that can be simply pulled out of the ‘box’ body for easy film loading. 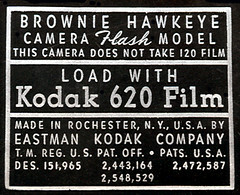 This is a one-color print in silver ink, stamped on the inside of the case of an Eastman-Kodak Brownie Hawkeye Flash camera. It tells the user the camera model and what film to use. I particularly like the various eye-pleasing fonts and relatively clean layout. Tasteful hints of Art Deco. If you like what you see here (or on Flickr), say something!